In securing BREEAM Outstanding for the Living Planet Centre, WWF achieved their ambition of using smart design, materials and technology to create a state-of-the-art building with minimal environmental impact. 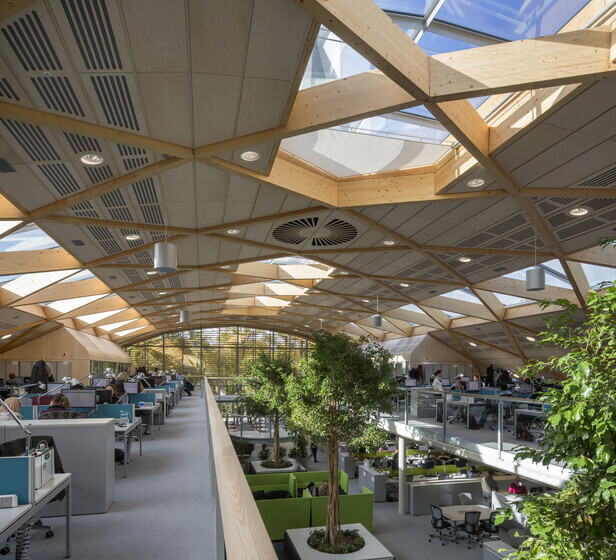 While the curved timber ‘diagrid’ roof with embedded skylights maximises natural light throughout the building, the lighting scheme was conceived to compliment the stunning architecture. At 5.5W/m², the installed lighting load is considerably lower than a conventional office: this was a significant contributor to the 90.66% BREEAM pass mark. A key challenge was lighting the open-plan office space at podium level. Pendants clashed architecturally with the clean lines of the curved diagrid roof, which restricted the lighting to a limited number of positions within the diagrid itself. By modelling the space and working closely with the Architect, recessed downlighters emerged as the solution meeting both light equirements and integrating seamlessly with the curved architectural timber roof. At the time of design, current LED technology could not provide the required lumen package, so compact fluorescent was used: to help future-proof the building, fittings allow for upgrade to LED once technology permits. Bespoke inclination adaptors were developed to match the varying angles of the curved ceiling ensuring truly integrated lighting within the diagrid. LED up-lights mounted at the springing point of the ceiling provide a soft wash to the diagrid at night. The lower office space had to be sufficiently flexible to allow for alternative patterns of working and use. The result was a grid of linear suspended fittings that reinforce the building’s architectural grid. The fittings were custom length utilising 28W T5 lamps to achieve an average illuminance of 300 lux. All internal lighting is controlled by a dedicated photocell/occupancy sensor that automatically dims local lighting when sufficient daylight is present or if a zone is left unoccupied for an extended period. An ‘app’ allows users full control of their individual lighting from their PC or laptop while meeting BREEAM requirements. In addition, desk lamps provide individual control over any additional, artificial lighting needs. All the lighting within the building is connected to a lighting control system, making extensive use of DALI dimming. What sets this scheme apart, is not the lighting sources or equipment choices but the highly integrated nature of the design that not just compliments but reinforces the architectural intent of the building while being highly energy efficient.